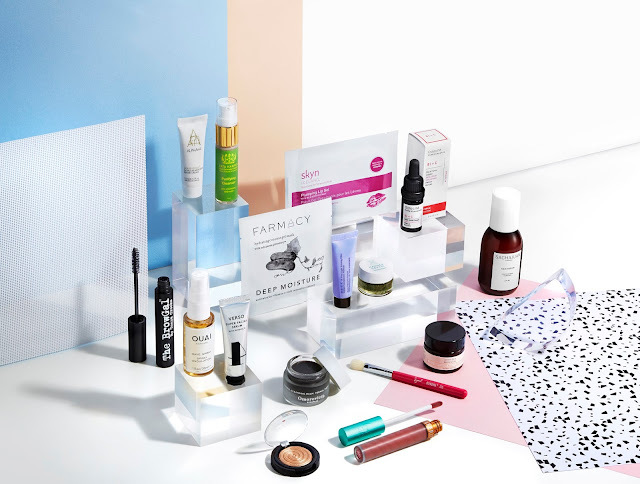 If you are a fan of Cult Beauty and their Goody Bags, then this Spring Beauty Bag is quite possibly one you need. Worth over £210 it is yours when you spend £110 here. Tata Harper Purifying Cleanser (15ml) - Powerfully purifying, this gentle creamy cleanser eliminates every last trace of make up and grime, while counteracting the ravages wrought by everyday exposure to pollutants and the elements. Alpha-H Liquid Gold 24 Hour Moisture Repair Cream (15ml) - Brimming with Liquid Gold’s signature glycolic acid, alongside argan stem cells and 24 carat gold flakes, this rich, rejuvenating treatment cream is suitable for use around the clock – stimulating sluggish cells and actively ‘undoing’ signs of damage while maintaining moisture levels. (full size) - Rein in rouge brow hairs with this see-through gel. Granting flexible hold which tames the strays without the stiffness and stickiness. Ouai Haircare Wave Spray (30ml) - Formulated with rice protein instead of traditional salt, this ultra-fine mist is the secret to loose, beachy waves without stiffness or ‘crunch’. With OUAI’s signature ‘Smart Technology’ – a cocktail of amino acids, tamarind seed, keratin, ama oil, hibiscus and jasmine – this tames as it tousles for beautiful bounce. Verso Super Facial Serum (10ml) - This thick, nutritive serum repairs and regenerates skin with a high dose of Verso’s patented Retinol 8 Complex. Instantly nourishing, the super-charged levels of Vitamin A have a dramatic impact of the tone, texture, clarity and luminosity of skin – reversing signs of ageing by stimulating the synthesis of collagen and skin-plumping hyaluronic acid. Farmacy Hydrating Coconut Gel Mask - Deep Moisture (Cucumber) - This Deep Moisture Coconut Gel Mask is just what the doctor ordered for skin that feels dry and tight. It contains FARMACY’s potent, patented complex Echinacea GreenEnvy (an antioxidant powerhouse), while vitamin C-rich cucumber extract reinforces the skin’s natural barrier to lock in moisture. Omorovicza Thermal Cleansing Balm (15ml) - Cleansing Balms come from some of the oldest traditions in beauty and one advocated over anything else in Asia for luminous skin. This black, oily balm is made with Hungarian Moor Mud and thermal waters - rich in clays that draw out impurities, clearing congested pores, while introducing key minerals calcium, zinc, copper & magnesium, which boosts the synthesis of collagen, strengthens the skin barrier and antioxidant defense against free radicals. An all in one facial cleanser and top notch make up remover. Laura Geller Baked Gelato Swirl Illuminator in Gilded Honey - Laura Geller’s Baked Gelato Swirl Illuminator has a beautiful buttery texture – applying and blending so seamlessly that the powder is almost a cream in consistency. Skyn Iceland Plumping Lip Gels - If your lips are beginning to appear a bit drawn or deflated, skyn ICELAND’s Plumping Lip Gels with Wild Berry Extract will replenish moisture levels and condition chapped or fragile skin with nourishing, Arctic ingredients. The perfect quick-fix for lips in need to TLC, each convenient gel patch stays put – delivering its precious, lip-rescuing powerhouses deep within the skin where they exhibit a gradual (natural) augmenting effect. Becca First Light Priming Filter (6ml) - BECCA’s beautiful, lavender-toned First Light Priming Filter is key to achieving a ‘soft focus’ gleam. Its lilac hue is brilliantly brightening – dispelling dullness and instantly neutralising sallow tones – while light-diffusing particles create a dewy, ‘gym skin’ finish. Hannes Dóttir Seamasque (10ml) - If you’re looking for a treatment that will turn around a tired, dull complexion, Hannes Dóttir's skin-renewing Seamasque works a charm - tightening and hydrating to restore youthful plumpness and recapture luminosity. Harnessing the potency of Iceland's indigenous plants and marine algaes - including nourishing sea kelp, calming spearmint oil and firming alum crystals - this mask is 100% natural. A gorgeous treat for those who like their skin care 'clean' yet wonderfully efficacious. Sigma Mini Blending Brush - A flawless finish requires professional tools, and Sigma Brushes are essential for blending your base, blush, shadows (and, you name it!) to perfection. Beauty Bakerie Lip Whip (full size in shade Versailles) - Lip Whips are phenomenally long-wearing, we were completely blown away when we first tried these liquid lipsticks – incredibly pigmented and in a spectrum of stunning colours, they guarantee a traffic-stopping, kiss-proof pout. Odacite Pimples Serum Concentrate (Black Cumin + Cajeput) Fullsize - Developed to respond to skin’s cycles and fluctuating ‘rhythms’, Odacité’s pure, pressed skin boosters contain only the finest, unadulterated plant seed extracts and essential oils, to address the changing needs of your complexion and correct existing signs of wear-and-tear. Aurelia Probiotic Skincare Cell Revitalise Night Moisturiser (20ml) - This Night Moisturiser stars a potent blend of anti-ageing powerhouses, to nurture and protect even sensitive skin types. Emollient without being greasy (no more stained pillowcases), this delicately scented crème is brimming with Aurelia’s signature probiotic technology and uses specific, ‘immune modulatory’ glycoproteins – cell surface molecules which enable cells to ‘talk’ to one another – to generate targeted impulses in the skin; balancing stress-damaged tissue whilst stabilising its defences. Sachajuan Hair Repair (Full size) - Hair Repair is your dream hair in a bottle. Used regularly, it helps restore shine to manes that are suffering the effects of too much styling and looking a bit frazzled. The unique combination of proteins and minerals penetrate the follicle, delivering intense hydration to heal split ends and banish frizzies for shiny, healthy looking hair. You'll see immediate improvement and will soon wonder how your hair survived so long without it. I am sure you will agree that this is quite a phenomenal bag with some amazing brands and products included and a great way to try out a few things that you have had your eye on for some time! It is Limited Availabilty so you will need to be quick to grab it - here. Do any of the products catch your attention? What an amazing goody bag with some really great products. Wow that is a beauty bag and a half!! Some great products too! Oh wow, this is an awesome beauty bag - what a brilliant price for so many products. It is always nice to have a great goodie bag, with a good selection of products. Liking the sound of the thermal mask, I love these things. Always feel so refreshed afterwards. Cult Beauty is one of my favourite places to shop! I love that they sell Becca and Jouer! I've not heard of a lot of theae products, especially eyebrow gel! What a lot of goodies! Sounds like a fantastic box! Wow that's such a good deal for so many amazing products!